Comments: Domestic authority exercised separately within Slavic Bloc and Republic of China. Despite reports of friction in the Sino-Slavic alliance, it has held firm now for four decades. Comments: Coalition leverages allied territory to ensure integrity of hemispheric defense grid and access to equatorial launch sites. Under no circumstances are allied troops used off-planet. Government: Varies, but largely authoritarian. Includes: Argentina, Australia*, Chile, European Union**, HK Geoplex***, India****, Indonesia, South Africa. Comments: U.S. and Eurasian Coalition have guaranteed neutrality of nations south of occupied zones. The status of this remains unclear in the wake of the Treaty of Zurich. * While theoretically independent, Australia has passed into HK economic/political orbit. ** The most powerful of neutral states, and the only one to possess significant off-planet territory (at L3 libration point). Currently ruled by the Euro Magnates. *** HK now situated in eastern New Guinea, following Unifying Accords of 2060. **** While theoretically neutral, India has disarmed following Indo-Eurasian War of 2071. Comments: U.S. leverages allied territory to ensure integrity of hemispheric defense grid and access to equatorial launch sites. Under no circumstances are allied troops used off-planet. Comments: Reformed Constitution limited suffrage to veterans, invested near-absolute executive powers in office of president, supported by the Inner Cabinet (which consists of heads of SpaceCom, InfoCom, ArmyCom, NavCom, CICom). Harrison has served as president for twenty-two years. *Lagrangian (libration) points are those areas where the gravitational fields of Earth and Moon are in balance, thereby allowing objects to remain stationary to both bodies. Their strategic import is thus of the highest magnitude. Treaty of Zurich, 2105 A.D. The two contracting powers obligate themselves to refrain from every act of force, every aggressive action and every attack against one another. The two contracting powers undertake to establish a Joint Environmental Commission, based in Zurich, whose members shall be charged with proposing worldwide environmental standards for industrial operations; the two contracting powers shall then act jointly to secure the ratification of these standards by all nations. The Joint Environmental Commission will operate in coordination with a Joint Space Commission, based in Zurich, whose members shall be charged with crafting plans to transfer as much industry as feasible to points in orbit and on celestial bodies. The two contracting powers recognize each other's sovereignty over their respective nets/information architectures and commit to keeping each other informed regarding communication protocols between them. The two contracting powers recognize each other's right to equatorial launch facilities. In this regard, the Eurasian Coalition will continue to maintain the exclusive right to make treaties with nations within the continent of Africa, while the United States will continue to maintain the exclusive right to make treaties with nations within the continent of South America. The two contracting powers recognize each other's territorial sovereignty over those segments of the geosynchronous orbits above their areas of terrestrial interest. Such sovereignty will include additional adjacent orbits, as determined by the Joint Space Commission. The two contracting powers confirm the Eurasian Coalition's territorial sovereignty over Lagrangian point L4 and confirm the United States' territorial sovereignty over Lagrangian points L2 and L5. In addition, Lagrangian points L1 and L3 are recognized as neutral, demilitarized sites. The United States renounces any exclusive claim to the Moon. The Eurasian Coalition will exercise sovereignty over territory amounting to no less than 25% of the Moon's surface and no less than 25% of the Moon's resources. Furthermore, both powers commit to a joint control of the Imbrium north of Archimedes Crater. This shall occur within six months of the signing of this treaty. Effective within two months of the signing of this treaty, the two contracting powers undertake to cease the testing of all classes of directed energy weapons. Upon amendment/ratification, the measures proposed by the Joint Arms Control Commission will be verified by agreed-upon satellite overflight and physical inspections of bases. In the event of a conflict between the two contracting powers concerning any question, the two parties will adjust this difference or conflict exclusively by friendly exchange of opinion or, if necessary, by an arbitration commission based either in Zurich or in Geneva. The present treaty will extend for a period of ten years with the understanding that if neither of the contracting parties announces its abrogation within one year of expiration of this period, it will continue in force automatically for another period of five years. The present treaty shall be ratified within the shortest possible time. The exchange of ratification documents is to take place in Zurich. The treaty becomes effective immediately upon signature. Phoenix Elevator shortly before attacks commenced. As many of you have observed, the downward pressure on our latest quarterly results reflects the growing difficulty of extracting tier-one intelligence from the United States. Many of you have also observed that our expectations here have been confounded: we anticipated that the signing of the Zurich Treaty meant that the resultant détente between the U.S. and the Eurasian Coalition would bring about a relaxing of martial law within both nations. Yet in retrospect, such an expectation seems naive—and compels us to focus anew upon the fundamental power-dynamics now prevailing within both superpowers. Within the United States, the key to those power-dynamics continues to be the Commands that comprise supreme government/military authority. As of this writing, there are five—SpaceCom, InfoCom, ArmyCom, NavCom, and CounterIntelligenceCom—and the infighting between them is as bitter as it is unceasing. Indeed, such friction has contributed in no small part to the hostile climate that now confronts our agents. Yet the shifting patterns of the rivalries/alliances formed by the Commands comprises the key to the reinvigoration of our Stateside intelligence efforts—all the more so given the price such intelligence now commands in the Eastern and neutral markets. The present configuration of the Commands is as follows. SpaceCom headed by Jharek Szilard: generally believed to be the most powerful of the Commands, with assets centered on the Moon, and in particular at the fleet at the L2 libration point above the Moon's farside. It is believed that elements within SpaceCom comprise one of the central sources of opposition to the president's policy of détente with the PanAsians. InfoCom headed by Stephanie Montrose: InfoCom was largely responsible for the reengineering of the U.S. zone on a military footing, and this Command continues to be responsible for the U.S. zone's security. Sources indicate that the rivalry between Space and Info has escalated precipitously since Zurich. ArmyCom headed by Hansson Secord: in theory, Army continues as an independent command; in practice, however, its assets have been divided among other Commands better able to articulate a vision of space-based warfare. InfoCom has acquired the infrastructure, SpaceCom, the non-ground-based strategic weaponry, while NavCom maintains responsibility for littoral units. NavCom headed by Stephan Asgard: perhaps surprisingly, NavCom has done reasonably well in an age of space-centric warfare, largely thanks to the ability of its leaders to evolve tactics centered on Rafts and undersea warfare. It should also be noted that NavCom's prestige is further enhanced by the fact that one of its number is now president; however, the president's hold on his ex-NavCom colleagues remains open to question. CounterIntelligenceCom (CICom) headed by Matthew Sinclair (aka "the Old Man"): though all the Commands now maintain their own intelligence operations, CICom continues to enjoy status as preeminent “watchdog” against foreign incursions. Sinclair and the current president are both ex-NavCom officers, and sources indicate that CICom and the Praetorians may be cooperating closely. *Based in London, and strictly apolitical, the Priam Combine specializes in the acquisition of information from both superpowers (and often sells the one information about the other). 2035: Global oil now long past peak. Global temperature continues to rise. Gas masks necessary in most urban hubs due to poor air quality. Flooding has begun on most coastlines. 2037: As world intensifies search for alternative fuel sources, Second Great Depression begins. Global economy goes into reverse. All major environmental treaties scrapped. 2039: Marshal Sergei Olenkov seizes power in Moscow; proclaims the restoration of Russian greatness. Purge of oligarchs begins. 2041: The Helios project launched: Euro-financed project to establish giant satellites to beam solar-generated microwave power down to Earth to provide clean energy. 2042: Communists overthrown in China. Sixteen-year civil war begins. 2043: Formation of the Slavic Bloc; alliance includes Russia, Ukraine, Belorus. 2045: Six years after coming to power, Olenkov announces that Russia will seek to "bury the hatchet" with the European Union in general, and with Germany in particular. He declares that his only quarrel is with the "grasping, avaricious American money barons who have brought both environmental and economic catastrophe upon us," and dedicates Russian power to purging Eurasia of U.S. influence. Russia begins massive armaments projects and full-scale "supermodernization" program, with a heavy emphasis on space-based systems and information technology. 2046: Collapse of European/U.S. talks. Europe declares it will steer a course "between East and West." U.S. withdraws last bases from Western Europe, accelerates own armaments program. 2047: U.S. claims the Moon as an exclusive American possession, begins construction of lunar fortresses. Russia decries "solar imperialism" but does not attempt reciprocal constructions—though Olenkov declares that "henceforth, space will be our nation's shield." 2048: Russia occupies libration point L4, sets up "research station" there that rapidly grows into set of major fortifications. 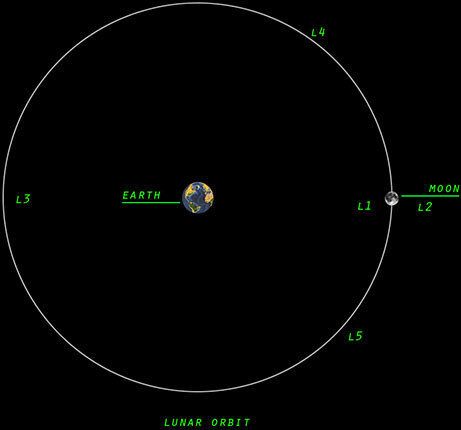 U.S. claims L5 and proceeds to leverage its lunar position to occupy L2. 2049: The Kyushu Incident. Horrific accident at fusion reactor complex devastates Japan, turning much of archipelago into contaminated wasteland. Evacuation of remainder of all islands by survivors occurs within six months. Several terrorist groups claim responsibility but no group or individual is ever brought to trial by any nation. Fusion programs worldwide reassessed in wake of tragedy. 2050s: Flooding now profoundly redefining coastal areas. New York, Washington, London, Los Angeles, among scores of cities maintained only through the construction of huge dyke-systems. U.S. and Russia accuse each other of intensifying environmental crisis through secret next-generation weapons tests. 2051: Helios Project abandoned in wake of evidence indicating that output is actually accelerating global warming by contributing to biosphere's total energy. Satellites are left to drift as derelicts or repurposed for purely space-based applications. 2053: Ukraine announces withdrawal from Slavic Bloc. Russian troops overthrow Ukrainian government, install regime that sues for reinstatement within the Bloc. 2054: Man lands on Mars: U.S. craft Boreas-3 touches down in Isidis Planitia. 2055: Fires devastate North American grasslands and forests in multiple regions simultaneously. Severe water shortages occur throughout U.S. Washington declares it will enforce emissions standards for developing nations; cites Brazil, Nigeria, Argentina as most flagrant violators of such standards. 2056: United States signs mutual defense pact with Mexico, Guatemala, Nicaragua, El Salvador, Panama. Begins extension of anti-missile shield to those countries. Local insurgencies intensify. 2057: United States, Canada reaffirm mutual defense pact. The Euro Magnates gain control of European Union, announce they will sign no treaties save those of commerce. 2058: Chinese "neo-Confucians" win the War of Inward Strife, which has wracked that nation since the early 2040s and taken more than fifty million lives. They proclaim that they will carry the struggle of the Third World against the United States to a successful conclusion. China re-launches space program "on a scale worthy of the Han people." 2059: China announces it will resume control of Hong Kong Free City in the New Year. 2060-61: Hong Kong, New Guinea sign Unifying Accords. Massive transfer of capital, infrastructure, population from former to latter occurs, over both Chinese and Indonesian protests. HK Geoplex established at site of Old Port Moresby. 2062: Russia and China agree on comprehensive border settlement. China declares U.S. monopoly of lunar resources a "crime which we shall put to rights." 2064: U.S.-Brazil War. (First Eco-War.) U.S. troops occupy Brazilian cities and force Brazilian government to sign the Treaty of Montevideo before withdrawing. 2065: Slavic Bloc and U.S. accuse each other of placing nuclear warheads in orbit. 2066: Establishment of the Russian-Chinese axis: "defensive" pact between the Slavic Bloc and China. 2067: Declaration of St. Petersburg by Slavic Bloc and China. The two powers proactively recognize the Monroe Doctrine and add their own corollary stipulating that the U.S. will not interfere in the affairs of the Eastern hemisphere. U.S. rejects declaration as "unbridled expansionism." 2068: Slavic Bloc and China begin comprehensive aid program to seven African nations in exchange for equatorial launch facilities. Russian and Chinese troops begin to combat local insurgencies. 2069: Scientists reports that almost one-third of all species on planet have become extinct in last half-century, with particularly heavy losses occurring in tropical zones. 2070: Formation of Eurasian Coalition. Slavic Bloc and China agree to pursue a combined foreign policy. Euro Magnates reaffirm their neutrality. 2071: Following a secret treaty with Pakistan, Eurasian Coalition launches a surprise strike on India. The Coalition's space-based offensive breaks the Indian defense grid within minutes. No nuclear weapons are used. India sues for peace and agrees to disarm in exchange for a guarantee of no occupation. The United States condemns the action, but does not intervene. 2074: In the name of national security, United States announces cauterization of its information systems from the global net. Eurasian Coalition follows suit. 2075: Coalition establishes permanent bases within nations of northern and central Africa. South Africa declares neutrality. 2078: Second Eco-War: following attacks on its assets, United States establishes permanent bases throughout South America, establishes treaties with all nations on that continent except for Chile, Argentina. 2079: Chinese hypersonic missiles strike American super-carrier USS Adams in the Indian Ocean. The Mauritian Stand-off occurs. The Coalition destroys U.S. satellites in geo-synchronous orbit above Eurasian heartland; U.S. retaliates in kind. World waits; but no further hostile actions occur. In aftermath of incident, both sides lay claim to adjacent portions of the geo orbits. 2080: Conflict intensifies in Middle East between the superpowers' proxy nations. Jaguar's Sword begins insurgency operations in South America, rapidly eclipses/subsumes other Latin guerrilla movements. 2082: Scientists warn global temperature increasing far faster than expected. 2084: Massive food and water riots occur within United States following the tightening of rations. Hysteria against alleged Eurasian infiltration, sabotage reaches fever-pitch. Conditions within Coalition believed to be similar. 2087: U.S. government defaults on debt, collapses. Military takes control of the means of production, restores order. 2088: Reformed Constitution proclaimed in Washington. Executive powers invested in Inner Cabinet, presided over by president, and comprised of heads of global commands: Army, Navy, Air, Space, Information, Counterintelligence. Senators serve terms for life, franchise limited to the military and to veterans. Martial law declared for the "duration of the emergency." Ex-admiral Andrew Harrison becomes president at the age of forty-one. 2090: Olenkov dies in Moscow at the age of ninety-five. 2091: Eurasian Coalition announces the completion of military exercises across multiple theaters which successfully demonstrate the integration of the Russian/Chinese military infrastructures and information architectures. Construction on Roaming Tundra begins: massive space station at the heart of the Eurasian geo defenses. 2093: The Euro Magnates begin work on the Europa Platform, at Lagrangian point L3. 2094: Air Force Command loses an internal power struggle: the Inner Cabinet assigns its assets to Space Command. From hereon in, most powerful commands are SpaceCom and InfoCom. 2098: Arab-Israeli conflict escalates beyond control. Tel Aviv, Jerusalem, Damascus, Tehran destroyed in a nuclear exchange. Radioactive fallout contaminates parts of southern Europe. 2099: "The Quickening"—strange lights blaze across upper atmosphere, are seen by hundreds of millions. Superpowers begin secret talks regarding environmental degradation/atmospheric destabilization. 2103: Moderates assumes power in the Praesidium, the Eurasian Coalition's governing entity. U.S. president makes first public statements advocating détente. 2105: Treaty of Zurich signed. U.S. and Eurasian Coalition agree to enforce rigid environmental proscriptions in their respective hemispheres. New age of international cooperation is heralded. Plans are laid for joint transfer of industry into space, wholesale colonization of Mars. In accordance with Article VIII of the treaty, Eurasian Coalition begins construction of bases on Moon. 2106: Jaguar's Sword extends operations into Mexico and Los Angeles Sprawl. 2107: Construction on Phoenix Elevator begins as joint project undertaken by the superpowers. 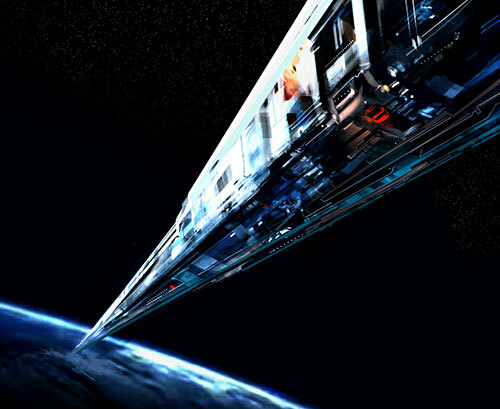 Blueprints call for a four-thousand kilometer long structure that will orbit the Earth and whose nadir will be reachable by suborbital transport capable of attaining a height of 150 kilometers. Construction time is estimated at four years. 2110: Autumn Rain initiates active operations.